Unique place, farm with house (190 m2) with 4 bedrooms (2 have private bathroom), living room with 2 large windows with view to the Dam, kitchen, WC, terrace, barbecue, wood oven, garage with 44 m2, biological lake with 200 m2 and more than 200 fruit trees and other trees. 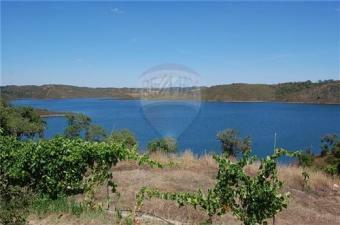 All of that on the bank of the Santa Clara`s Dam and with direct and private access to it. Inserted in a plot with 66 700 m2 (6.67 ha), this is an unique opportunity to enjoy a place that few can. With stunning views of the dam, is a quiet and reserved place. Located near the Municipal Road, between Santana da Serra and S�o Martinho das Amoreiras, has good access. Do not miss the opportunity to visit.